This week, we get Hankified. All the songs included in this week's show are by or about the lanky, hollow-eyed hillbilly Shakespeare from Montgomery, Alabama. 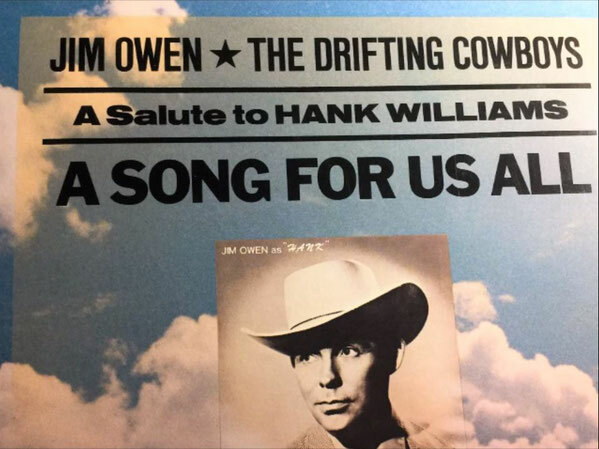 Our feature album is from Hank disciple Jim Owen: "A Song For Us All: A Salute To Hank Williams" (1977), and he's enlisted help from Hank's original Drifting Cowboys and the Charlie Daniels Band for this sensational project. Like countless others, Jim Owen was captivated by the mystery and aura of Hank Williams from a young age and set out to learn all he could about the man in terms of singing, style and mannerism. The result was a 90-minute, one-man show called "Hank" with which Jim Owen toured the country to rave reviews. With some wonderful commentary to link the songs together, Jim Owen (as Hank) released this album around the same time, as a humble tribute to the man who gave so many so much - and influenced generations of country fans and singers more than any one person can say. We picked the best tracks from this double album and continued the Hank theme with a plethora of songs from other Hankaholics - this week's show is mandatory listening for any and all fans of country music.